The great and the good (and mainly the rich) have been gathering in Davos in Switzerland this week for their annual conference ; and some of the great and the good in Rye will be gathering in the Town Hall on Monday to discuss a planning application to build more houses. But what links the two events? 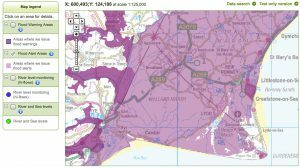 Well it’s rising sea levels, discussed at Davos in a session chaired by Prince William and possible flooding resulting from this rise is bound to be discussed by Rye Town Council when it considers the new planning application for the Lower School site. Much of the land around Rye has been reclaimed from the sea, and is below sea level. That means it can flood, and Rye was on the verge of that happening around Christmas a couple of years back. If you look at the historic maps from medieval times, there was a lot of land that used to be tidal in the past and was navigable by sea-going vessels right up to Bodiam Castle. However I’ve always looked at the maps and reckoned my house in Valley Park off the Udimore Road (above the 30 metre contour line) was above the medieval water levels though, if something bad happened, Tilling Green might disappear from sight. 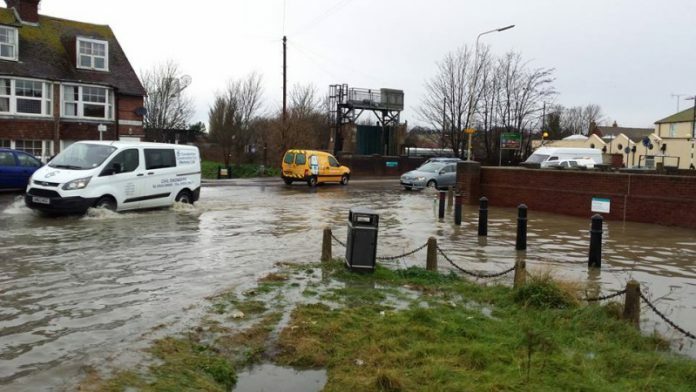 A similar risk of flooding also applies to the former Lower School site off Ferry Road which the town council will be discussing on Monday. Sea levels are rising (by 19cm in the last century) and the rate has apparently speeded up since 1993 – and there could be a 3 ft rise by 2100, some predict. But this does not seem a lot. However the ice caps at both Poles, and a number of mountain glaciers, are melting away and, if they completely melted, sea levels could, some say, rise by 70 metres or 230 feet. Looking quickly at a local Ordnance Survey map this could mean the sea washing over Ashford and crashing into the North Downs, with Rye, the Isle of Oxney, Icklesham and Valley Park all under water. But that is a little way off (allegedly) unless global warming speeds up the icecaps melting. However that does not make the Lower School site any less risky – and the planning proposal seems to recognise that a safe haven could be needed for the prospective residents if an incoming tide spills over. But another aspect of this possibly unacceptable proposal is adequate parking for both residents and their visitors, and maybe we should learn from the Dutch and put our homes up on stilts with the cars underneath. That may be the least of our problems though if the ice caps continue to melt. Image Credits: Rye News library, Environment Agency. All this populist talk of global warming forgets that the SE of the British isles is sinking and the NW is rising. This is the principal reason a new Thames Barrier is being planned. Mind you it wont help Rye so the boat in the garage idea is not such a bad one. But if some readers could explain to me why where we play golf for many years now I used to swim as a boy. The high tide now must be about 1/2 a mile further from the Rye jubilee golf course so no rising of sea levels but the opposite the tide is ebbing further away??? Coastal erosion and accretion is not a straight line, we have long shore drift a coastal current that runs south to north, link this with weather events, we live in volatile times. The UKCP18 forecast from the met office gives a worst case sea level rise of 1.15 metres by the turn of the century…but sea level rise will continue…and who knows in ten years time the warnings could be more extreme. But I believe we will have to spend more money on defending what we want and need to defend from the rising tide. I think you’ll find that the apparent growth of the Jubilee course is caused by the prevailing wind picking up the sand from the beach and blowing it inland. Fear not the sea levels are still rising – It’s just that in this case the wind and sand are causing the land to rise a little quicker than the sea. I think you will find that before long the Jubilee will also have 18 holes – perhaps more!